039 are a five-piece Progressive Metal group from near Milan in Italy. 039 is the national telephone prefix for Italy, hence their name. 'Amalgama' is the group's debut album which they have been working on for two years. 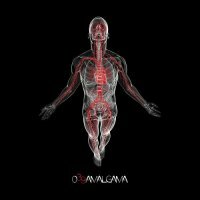 According to the minimal blurb that accompanied the album, it is influenced by "life and death, love achieved and love which is lost, harmony and seclusion"; when roughly translated from Italian, 'Amalgama' means 'Blend' which would tie in with the lyrical content and the different musical styles. The "Glass Man" shown on the album cover summarises the eleven songs; the individual, deprived by the delusion of his skin, showing his inner experiences, his true passions and desires but also his most secret fears. The album begins with a short instrumental in a Hip-Hop vein (!) which leads into a heavy as hell, crunching riff for 'Dexter' that wouldn't go amiss on a Metallica track. Vocalist Bruno D'Aleo has quite a strong accent but this doesn't detract from the song and Ruggero Ascione adds an excellent guitar solo. 'What's Left' begins with the riff from Ozzy Osbourne's 'No More Tears' which is repeated several times during the song. We also have a mixture of quieter keyboards from Marco Zanibelli matched against some more monstrous melodies which end up sounding like a hybrid of Dream Theater, Vanden Plas and Kamelot! 'Out Of Time (Part 1)' is initially a slower number dominated by Zanibelli's piano before the rhythm section of bassist Daniele Carozzi and drummer Emanuele Rossi kicks in and Ascione again provides some gargantuan sounding guitar. The song actually finishes with a snippet of Pink Floyd's 'Time'; I'm not sure what Roger Waters would have to say about that! 'Away From The Sun' is a slow tune featuring piano and strings and a guest vocal from Silvia Elisa Muratori. First single 'Mother' is another heavy song very reminiscent of VP which, halfway through, slows down for a short piano interlude before Ascione blows us away with another blistering solo. 'Blood' features acoustic guitar and lush synths and, of course, has yet another heavy guitar solo which some may argue doesn't fit in with the rest of the track. Instrumental 'Coma' builds up slowly with some organic sounding samples before the band join in and this is definitely a DT-inspired number. Title track 'Amalgama' contains some nice bass from Carozzi and excellent vocals from D'Aleo. This one contains a mixture of styles even managing to sound Psychedelic in places. So, an interesting debut from the Italian quintet, nothing ground-breaking but fans of the Progressive Metal genre should find plenty of songs here worth discovering.